A third generation Butchery Shop needed a solution for the re-building of their existing cold room and therefore required temporary storage of their meat carcasses. The problems they encountered were that their building (300 years old and listed) backed onto a new apartment block where people were now residing. They were also concerned about any damage to their building as access and space was extremely tight. 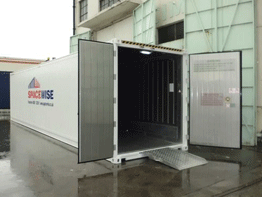 Spacewise found a solution by supplying a low noise, low energy machine and this was installed using highly trained and skilled HIAB Crane Operator. 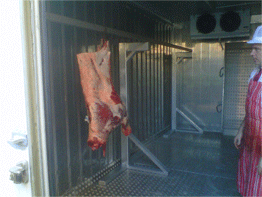 In addition Spacewise also manufactured a Stainless Steel Food grade Meat Hanging Rack for the storage of their meat carcasses. The unit was installed with no damage to the building and zero complaints from the adjoining residents. A local bakery required additional chilled and frozen storage but were convinced that they could not use containers due to a space issue. However upon our detailed site inspection and careful delivery we succeeded! During the peak Christmas period the supermarkets require high volumes of equipment to be delivered and commissioned in a very short space of time. 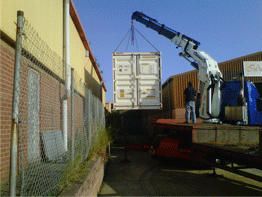 Spacewise supply, delivers, installs and maintains high volumes of equipment 24/7 during this extremely busy time. The whole project is managed in house by the Spacewise team. 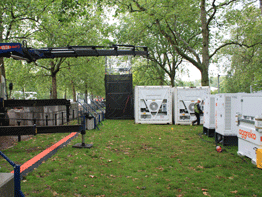 During the London 2012 Olympics Spacewise was required to install units into the Royal Greenwich Park. The gradients of the park were a challenge but were overcome by Spacewise project managing leveling of the containers. 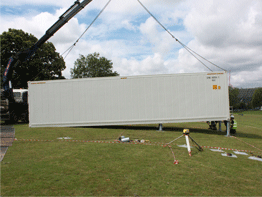 During the London 2012 Olympics there were issues surrounding the install of refrigerated containers into St. James Park just off Pall Mall. The Royal Parks were extremely concerned regards damage to trees and grass and the environmental impact of running refrigerated containers within this area. Spacewise solution was to use low noise, low energy machines. The details of these were scrutinized and subsequently passed by The Royal Parks as being acceptable. Spacewise then installed the containers using highly skilled and trained HIAB Crane Operators under supervision of The Royal Parks to ensure we did not even knock a leaf off! 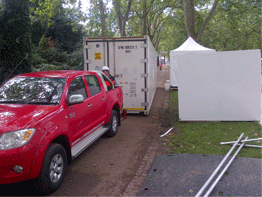 We were informed that it was impossible to install units down a narrow pathway with the Royal Park at Westminster - they were wrong! Spacewise found a solution for safely off loading into a nearby road and skating unit into place using container skates and an adapted 4 x 4 truck. No squirrels were harmed in the process!